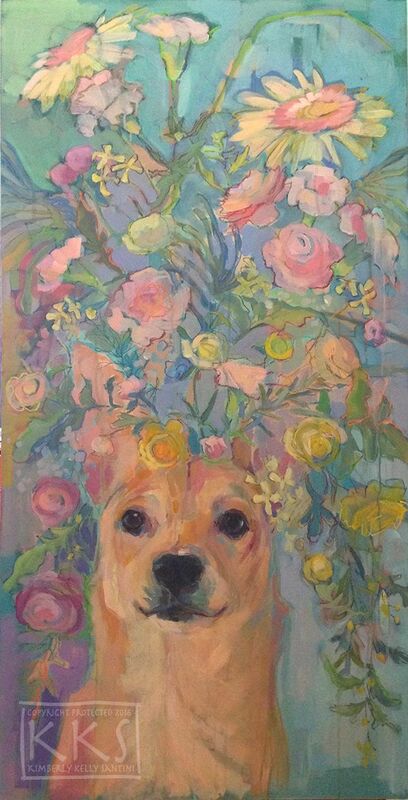 "Salvador Doggie," 24" x 48", acrylics on panel, $1499 plua a&h to the first asking nicely. I accept paypal, venmo, personal checks and payment plans. Inquiries may come directly to moi - and thank you very much! And then, while walking into the pet store to get food for the three thousand animals we already were caring for, we ran into this little guy. There was an adoption event, and he was there, sitting on someone's lap. He locked eyes with The Princess, and then my hub, and he fell apart. It was like they were separated at birth. How could I say no to the way he turned himself inside out just to be seen by them? Or how he melted into their bodies and returned hugs with a deep sigh? I melted too. He came home with us. And now is the official lap warmer in our household. It's a true life happily ever after.